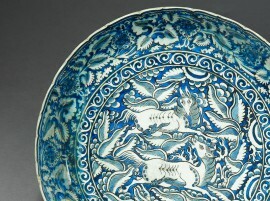 The Ashmolean has an important collection of works from the Islamic Middle East, totalling well over 4,000 objects. The collection includes fine pieces of ceramics, metalwork, glass, wood and ivory, textiles, and works on paper and parchment, made in a wide region extending from Spain to Central Asia over a period of over a thousand years. 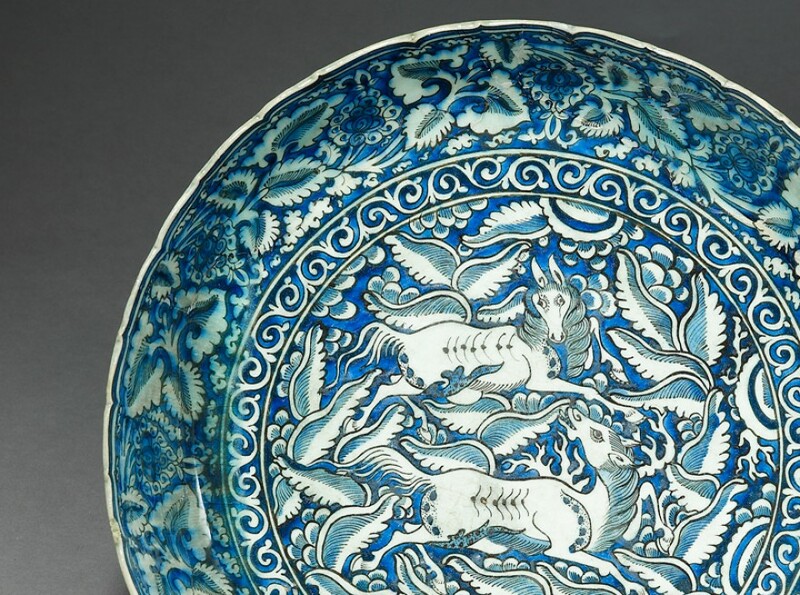 The Museum's extensive collection of Islamic ceramics dating from the 8th to the 19th centuries is particularly important. Numbering over 1500 pieces, this collection forms a major resource for research and teaching both for the University of Oxford and visiting students and scholars. The collection's core is formed by the generous gifts to the Museum by Sir Alan Barlow and Gerald Reitlinger, in 1956 and 1978 respectively. A significant selection of vessels and tiles is on permanent display in the Islamic Middle East gallery. The Museum's collection is complemented by extensive archaeological material from Islamic Syria, Iraq and Iran. Equally remarkable is the collection of textiles. The Newberry Collection, donated to the Museum by Percy E. Newberry (1869-1949) in 1946, includes over 1,000 embroidery fragments from Islamic Egypt - the largest collection of medieval Islamic embroideries in any public museum. In addition, Newberry donated over 1,200 printed cotton fragments from Gujarat, but imported into Egypt in early Islamic times, which are of significance for both the Islamic and Indian collections at the Museum, providing vital evidence of the Indian Ocean trade. Since 1975 the Department of Eastern Art has also housed the Creswell Archive - the unique negative collection of Professor K.A.C. Creswell (1879-1974). An eminent pioneer of medieval Islamic architectural history, Creswell carried out extensive photographic campaigns of Islamic architecture, with a focus on 12th- to 15th-century buildings in Egypt and the Levant. Among the photographs are many of those used to illustrate Creswell's essential publications, Early Muslim Architecture (1932-69), and Muslim Architecture of Egypt (1952-59). Finally, the Department holds a collection of about 200 carpets and weavings. More than 150 of these were bequeathed by May Hamilton Beattie (1908-1997), a distinguished scholar in the field of Carpet Studies, for the purpose of hands-on study by students. May Beattie's bequest included 55 volumes of notes recording details of all the carpets she examined in the course of her working life, her extensive photographic archive, numerous files of correspondence, and a specialized library of more than 1400 volumes. All this material now forms the Beattie Archive, officially established in June 2000.